Copyright © Mike Griffin. All Rights Reserved. Push your Database Schema (Metadata only) up to the My2ndGeneration cloud. What developer doesn't have a good grasp of the T-SQL syntax? 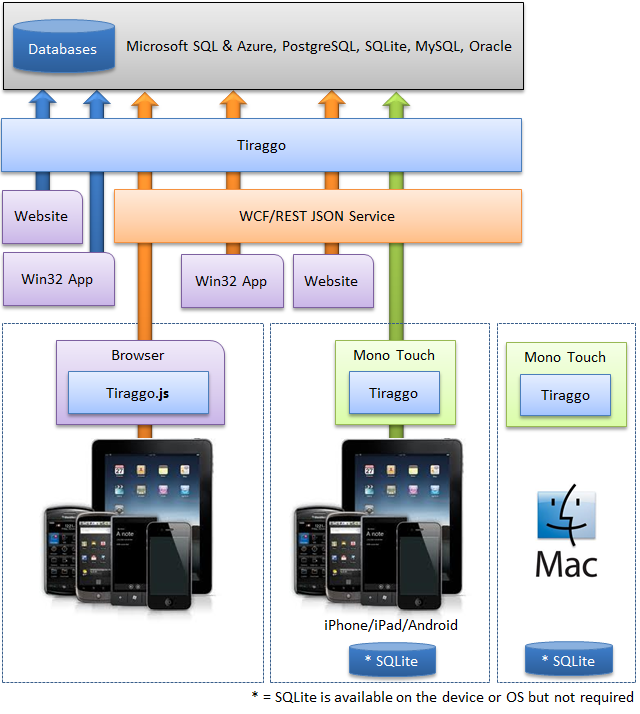 The goal behind the Tiraggo API is to mimic the T-SQL syntax. This has two advantages, your learning curve is minimal and the generated SQL is very clean. The sample below demonstrates a self join on the Employees table which is looking for all employees with an 'a' in their last name who have people reporting to them. Kind of silly but it shows off the syntax. Yep, you can actually select only the columns you desire and the SQL is extremely lean. NOTE: InnerJoin is used above, also supported are RightJoin, LeftJoin, CrossJoin, and FullJoin. Compare that SQL to the SQL generated by a Entity Framework query which does the same thing and you'll be shocked. Use the native language syntax, it works as you expect it would. && = SQL 'AND' in VB use "And"
|| = SQL 'OR' in VB use "Or"
DatePart - Returns the value of part of a datetime value. Round - Rounds the numeric-expression to the desired places after the decimal point. SelectAllExcept() is not really a SubQuery, just a convenient enhancement that allows you to select all except one or more listed columns. This is the traditional way of paging and works on all versions of SQL Server. You always need an OrderBy when sorting. Using Skip and Take for paging. Skip and Take Require Microsoft SQL 2012 at a minimum and is a much nicer syntax. This query doesn’t really make sense, but we wanted to show you what will be possible in the next release. A SubQuery in a Select clause must return a single value. This is the same as the query above, but returns all columns in the Order table, instead of just OrderID and OrderDate. Notice that the Select clause contains orders, not orders.. The SQL produced will use the supplied alias o..
An aggregate requires a GROUP BY for each column in the SELECT that is not an aggregate. Sometimes you wish to include columns in your result set that you do not wish to group by. One way to accomplish this is by using a SubQuery in the From clause that contains the aggregate the way you want it grouped. The outer query contains the results of the aggregate, plus any additional columns. If you use a SubQuery in a From clause, you must give the From clause its own alias (shown below as "sub"). In the outer query, to refer to an aliased element in the From SubQuery, use the inline raw SQL technique to qualify the aggregate's alias with the From clause alias, i.e., "". In and NotIn are two of the most common operators used in a Where SubQuery. The following produces a result set containing Territories that an Employee is not associated with. // SubQuery of Territories that Employee 1 is assigned to. // Territories that Employee 1 is not assigned to. Exists evaluates to true, if the SubQuery returns a result set. // SubQuery of Employees with a null Supervisor column. // then run a list of all employees. SubQueries cannot be used directly within a Join(SubQuery) clause, but they can be used within a Join(query).On(SubQuery) clause. A correlated SubQuery is where the inner query relies on an element of the outer query. The inner select cannot run on its own. Below, the inner pq query uses the outer query's oiq.ProductID in the Where() clause. Tiraggo supports nesting of SubQueries. Each database vendor has their own limits on just how deep the nesting can go. Tiraggo supports two different syntax approaches to nested SubQueries. Traditional SQL-style syntax is most useful if you already have a query designed using standard SQL, and are just converting it to a DynamicQuery. // last name starts with 'S'. Nesting by query instance name can be easier to understand and construct, if you are starting from scratch, and have no pre-existing SQL to go by. The trick is to start with the inner-most SubQuery and work your way out. The query below produces the same results as the traditional SQL-style query above. The instance names are color coded to emphasize how they are nested. // Employees whose LastName begins with 'S'. ANY, ALL, and SOME are SubQuery qualifiers. They precede the SubQuery they apply to. For most databases, ANY and SOME are synonymous. Usually, if you use an operator (>, >=, =, <, <=) in a Where clause against a SubQuery, then the SubQuery must return a single value. By applying a qualifier to the SubQuery, you can use operators against SubQueries that return multiple results. Notice, below, that the ALL qualifier is set to true for the SubQuery with "cq.tg.All = true;". // less than all of the dates in the CustomerQuery above. Below, is a nested SubQuery. The ANY qualifier is set to true for the middle SubQuery with "cq.tg.Any = true;". // less than any one of the dates in the CustomerQuery above. These might be kind of silly but they demonstrate syntax. There may be times when you need to access some SQL feature that is not supported by the DynamicQuery API. But, now having used and fallen in love with DynamicQuery, the last thing you want to do is stop and go write a stored procedure or create a view. We have always supported the raw injection feature in our Select statement, but it will soon be available almost everywhere. The way it works is you pass in raw SQL in the form of a string surrounded by < > angle brackets. That indicates that you want the raw SQL passed directly to the database engine “as is”. Of course, you could easily write the above query without injection, but you get the idea. The escape hatch will be available to you almost everywhere …. Using the raw SQL injection techniques above will allow you to invoke SQL functions that we don’t support, including database vender specific SQL, and so on. Hopefully, you will almost never have to resort to writing a custom load method to invoke a stored procedure or an entirely hand written SQL statement. Of course, you can use our native API everywhere and just inject the raw SQL on the GroupBy for instance. You can mix and match to get the desired SQL. The examples given above were designed to demonstrate (and test) usage in a variety of settings. They are not necessarily the simplest, or most efficient, way to achieve the desired result set. Think of them as an API usage guide, not as design guidelines. Most SubQueries can be re-written as Joins, and most Joins can be re-written as SubQueries. If, while coding, you are having trouble conceptualizing one approach, then try the other. Technically, a JOIN's ON clause can take almost any where_condition, and Tiraggo supports many of these, including SubQueries. But, I agree with most authorities on the subject, that the ON clause should be reserved for the conditions that relate the two tables. All other conditional statements should be placed in a WHERE clause. Typically, the ON clause only contains a column from each table and a comparison operator. For example, take the Join(query).On(SubQuery) example above. The much simpler query below returns the same result set. Its Where() clause not only simplifies the On() clause, but eliminates the SubQuery completely.